When I asked my father what he wanted for Father’s Day he told me he wanted one of my “I Love You Because . . .” books. It meant a lot to me to have my project valued by him as a gift. I decided to create an image for him to slip into the book. It had been more than a year since I created an ILYB image and I really enjoyed the process. I remembered why I started this project in the first place! 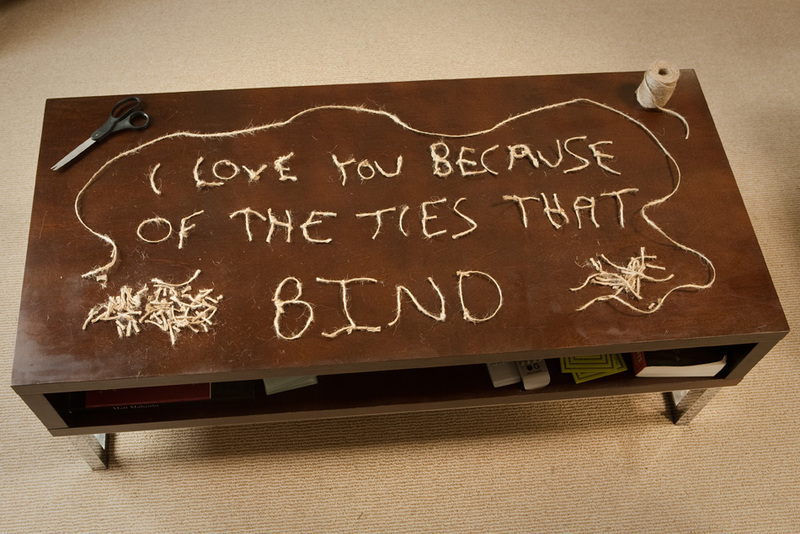 As I sat there tying twine into letters I got a chance to reflect on love and what it means in my family. My love for my father has roots in the things he’s taught me, how he is always there for me (in marked contrast to his father who wasn’t there for him), and in the things he’s given me. But expressing those reasons in the image wasn’t quite the angle I wanted to use. As I thought about it more I was reminded of the saying “the ties that bind” which often refers to the relationships we’re in. I love my father because he is part of my life, because he is inextricably bound up in who I am in the world, and because, well, he’s my father. A few years ago for Father’s Day I made him a braid out of thick rope. Three strands represented me and my two brothers and one strand represented my father. Four strands, interwoven. I hadn’t thought about that in a while but the process of cutting and tying the twine into letters brought it back to me. Our lives are intertwined and I love him for that.